You consider yourself to be a sane…ish individual. You have a steady job just like anybody else. You are not looking to get yourself killed or anything silly like that. However, when you stand at the base of a tall building or cliff, something in the back of your mind says jump. In fact, when standing at the railing on the 20th-floor balcony, the only thing stopping you from jumping is an unwillingness to turn into a red smudge on the ground. As such, you find yourself drawn into the wild world of BASE jumping. You have already gotten sick of jumping out of perfectly good aircraft, and now you need something else to leap from. However, not any old building or mountaintop will do. You need something special, something that you will remember for years. Consider the following locations next time you are looking to cheat death. Yosemite is considered the birthing place of base jumping because this was where the founders of the sport first attempted it in the 60’s. The most popular spot is the El Capitan, and even though the Yosemite guards and authorities do not approve base jumps there, some extreme sports seekers still attempt jumping every year. Those who do often have to sneak the jump and fall farther down before deploying their parachute to avoid being caught. If you are going to the El Cap, make sure you know the rules. 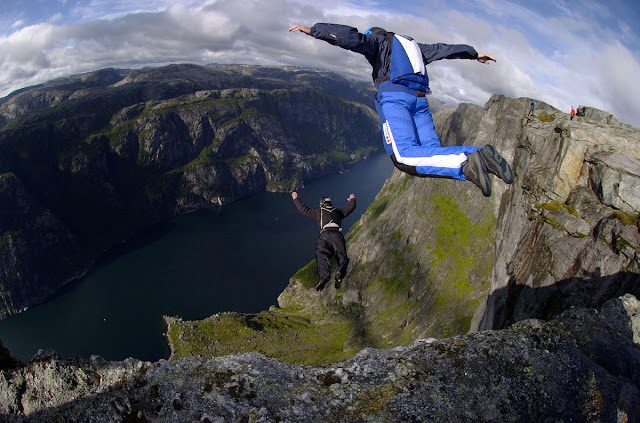 Norway loves base jumping. Little wonder, since they have awesome spots from which people can seek and get their fill of adrenaline rush. One of these is the Troll Wall. One of the Troll Peaks provides a 1000m drop. The only issue with jumping from this wall is the fact that the rock face is loose and could cause jumpers to trip and fall. Also, rescuers often have a hard time reaching and saving jumpers if there are problems. This is why only highly experienced and expert jumpers are allowed to jump from the wall. The good thing is if you finally get to jump, the scenery can be outstanding. While many people visit the Eiffel Tower for its historical value and spectacular scenery, others do so for the sake of base jumping. This is not surprising seeing as the Eiffel Tower offers a drop of 324 meters. Hundreds – if not thousands – of jumpers leap from the observation deck every year to get their adrenaline fix. So, when next you are in France and looking to do something a little more thrilling than walking around the city and taking in the sights and sounds, go base jump from the Eiffel Tower. Quick Disclaimer: This location has recorded more base jumping deaths than other jumping spots in the world. But what’s a little flirt with death if the odds are in your favor. The Lauterbrunnen valley boasts of a number of cliffs that you can leap from and many instructors for beginner jumpers. Starting your base jumping here will make for a good story with the boys when you hang out. After all, not many people get to “do the dance with the devil” when they first start base jumping. Honorable mentions include the Burj Khalifa in Dubai, Angel Falls in Venezuela, Perrine Bridge in Idaho, Petronas Twin Towers in Malaysia, Jinmao Tower in Shanghai, China and New River Gorge Bridge in West Virginia, US. As with any extreme sport, the key to survival is in preparation. Make sure you have all of the equipment needed to make the jump. Since most of these spots are out in the middle of nowhere, you will also need basic survival gear including waterproof bags to keep your parachute dry. For these items I recommend turning to www.adventurelion.com. Oscar King is an extreme sports enthusiast who writes about the best places to go and do some of the craziest things in the world. Assuming he is still around by the time this article is published, you can learn more about him by visiting his profile on Google+. What a thrilling experience. Not right up my alley, though. I will share this to my friends. I like to try to jump and this would be a nice to explore the adventure. There's no way I can do that. Height and speed is not my thing, lol. gusto ko sana, but I am afraid of heights. These are perfect places for any dare devil to explore. I cannot do that as I am scared of heights.